The first day of the trial took place today in Denmark. 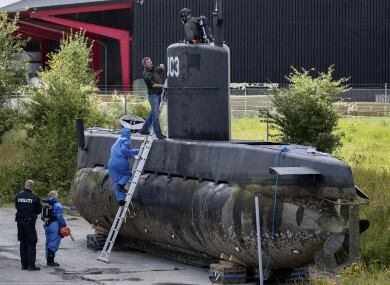 Police technicians board submarine UC3 Nautilus on a pier in Copenhagen harbor, Denmark, last August. Warning that this story contains graphic content. DANISH INVENTOR PETER Madsen has denied murdering Swedish journalist Kim Wall aboard his self-built submarine, saying she died when the air pressure suddenly dropped and toxic fumes filled the vessel. I wanted to spare her family and the world the details … about what actually happened when she died because it is gruesome. He said a vacuum effect meant he was unable to open the hatch to get into Wall, who was screaming for help. “I try to explain to Kim through the hatch how to stop the necessary engines, for five to 15 minutes I tried to get into to her,” Madsen said. Wall was reported missing by her boyfriend after she failed to return home from her trip on the 60-foot vessel on 10 August. Prosecutors today cited a psychological assessment which declared him “a perverted polymorph, and highly sexually deviant”. Buch-Jepsen said Madsen then killed her – probably strangling or slitting her throat – and cut her up with a saw, stuffing her torso, head, arms and legs in separate bags weighed down with metal objects, and dumping them in Koge Bay off Copenhagen. Investigators never found Wall’s or Madsen’s phones but were able to recreate some of the messages on them. On the morning of 10 August, Madsen googled graphic videos of women being mutilated, the prosecutor said. On 26 July, he also googled “female beheading” and watched the videos. The prosecution has said it will seek a life sentence, which in Denmark averages around 16 years. A verdict is expected on 25 April. Email “Danish inventor who denies murdering journalist aboard his submarine says she died of toxic fumes”. Feedback on “Danish inventor who denies murdering journalist aboard his submarine says she died of toxic fumes”.